25 Green Heron is a spectacular custom oceanfront home in Sea Pines with 7 bedrooms, bedding for up to 26 guests, abundant living spaces, renovated kitchen and bathrooms, multiple deck areas, screened porch, and private pool, spa and beach path. Major 2019 renovations were designed to provide a comfortable, casual and exciting new beach experience for guests of all ages and smart TVs have been added in all bedrooms and living/sitting areas. 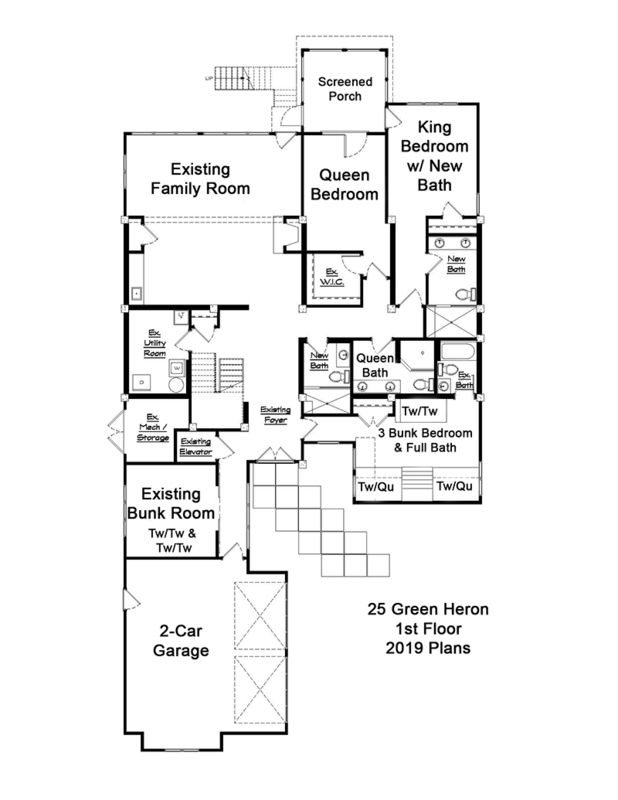 The two-story home features bedrooms and common areas on both levels. The 1st floor of the home features 4 bedrooms, including a King suite with a large closet and fully renovated, luxurious bathroom with double vanity and walk-in shower. The bedroom next door has a queen bed, walk-in closet and a full bath with double vanity and walk-in shower right outside the bedroom door. Both of these bedrooms share a furnished screened porch. The other two bedrooms on the 1st floor are full of bunk beds! One bedroom suite has 3 sets of bunk beds including one (1) Twin-over-Twin and two (2) Twin XL-over-Queen mattresses. This bedroom also has a full en-suite bathroom with shower/tub combination. The 4th bedroom features two sets of Twin-over-Twin bunk beds and a sliding barn door for privacy. Guests in this room can use a nearby full bath with a walk-in shower that also serves the Family Room. 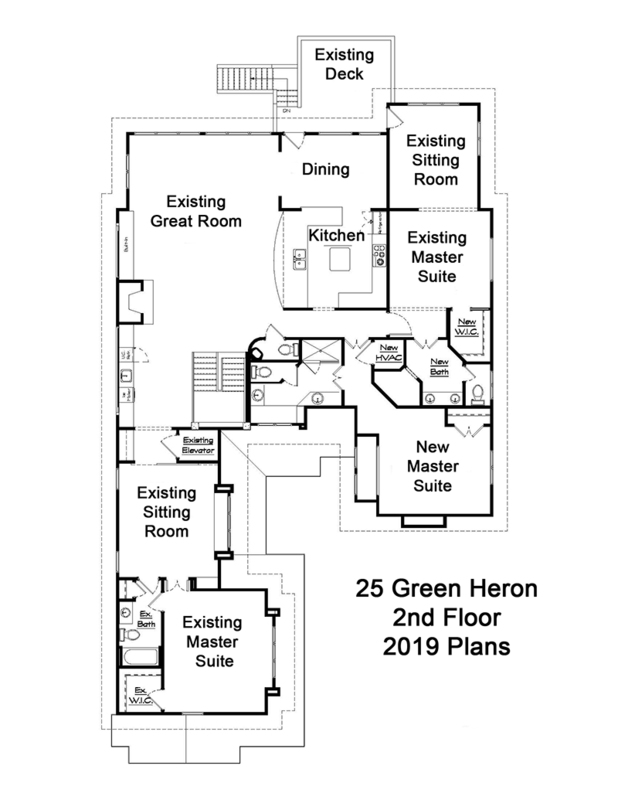 Also included on the 1st floor is a Family Room with game/dining table, full-size refrigerator with icemaker, sink, garbage disposal, microwave and large flat screen, wall-mounted TV. Guest also have access to the 2-car garage on this level and the remodeled utility room with full size washer, dryer and laundry sink. The 2nd floor of the home offers beautiful sweeping ocean views and features 3 king suites, large Great Room, a renovated kitchen and eating areas including a breakfast table, dining table and bar counter with stools. The Great Room is updated with beautiful furniture and accessories and offers a large TV, sofas, chairs and a game table that can double as overflow seating for meals. The kitchen is fully renovated with all new appliances and a large eating bar. It is complemented by a new adjacent wet bar with ice maker, coffee bar, refrigerator, sink, second dishwasher and bistro table. The king suites on the 2nd floor include a king bedroom with separate sitting area and sleeper sofa that share a full bath with shower/tub combination. This entire suite is very private with barn doors and can be used by a couple or a small family. The second suite was an addition in the renovation and features a king bed, closet and luxurious bathroom with double vanity and walk-in shower. The 3rd suite is a king bedroom with sitting area viewing the pool and ocean and features a brand new bathroom with double vanity and walk-in shower. This home also features wonderful amenities, including free Wifi, gas grill and multiple deck areas in addition to the screened porch and garage mentioned on the 1st floor. Your own private beach walk will take you to Hilton Head’s most beautiful stretch of beach, and along the way you can enjoy 25 Green Heron’s large, private swimming pool. The pool is surrounded by manicured grounds and is absolutely beautiful. The pool deck is equipped with lounge chairs and umbrella tables with chairs for relaxing, and the recent renovation adds a new elevated pool deck, Arbor with swing and a pool cabana with half bath, undercounter refrigerator and outdoor shower. The location in Sea Pines is on a large double lot with lush landscape and beautiful walkways to take you to sunny oceanfront pool and beach. This section of beach is one of the widest you will find on Hilton Head Island and offers peace and privacy away from beach club crowds. The exceptional interior design features outstanding architectural elements mixed with original artwork and fine, yet cozy furnishings. The kitchen is equipped with top-of-the-line appliances and granite countertops. The location in Sea Pines is close to all the activities and amenities in the resort including golf, tennis, marina activities, riding stables and forest preserve. We worked primarily with Gail and she was exceptionally helpful and friendly. We loved the house at 25 Green Heron Road. My adult children and their children had a fabulous time. they enjoyed the luxuriousness of the home, the pool and the private access to the beach. The location in Sea Pines was special. So near to Harbourtown and the Ocean Gate.We can't come back next year but you can be sure we will return as soon as we can. The two sitting areas - upstairs and down were very useful and everyone appreciated the 7 and 1/2 bathrooms. A couple of very minor items you should be aware of: the doorbell didn't work and a couple of ceiling light bulbs were out. Otherwise everything was great and it made for a great week! Plenty of room for our family of 18. The house has a big pool and is very close to the beach. Everyone really enjoyed our stay here. "Awesome Time in an Extremely Clean House"
This was a great layout for big family. The pool is beautiful and we heated it for an April stay would recommend. No complaints and Destination Vacation was very easy to work with.